Mathew Kustel from the U.S. came to India to study Hindi and to explore ‘the India’ that tourists generally do not get to see. An excerpt from Mathew Kustel’s note to his friends on his visit to India. Working in the field of responsible tourism gives me the opportunity to see many interesting projects worldwide. Though, would I have to pick my favourite projects now, they would be the two IIMPACT learning centers I was privileged to visit on the occasion of my last North India trip. These girls touched my heart in a very special way and I could see that the learning centers mean an uplift to these villages. Education surely is one of the most vital tools to fight poverty and I firmly believe that when you educate a girl you educate the whole family. Let me wish you all the best for your most valuable work and the chance to open many more learning centers throughout India. December 5th, 6th and 7th of 2011 shall forever be etched in my heart! Reason? My visit to the IIMPACT Learning Centers in Gajapati district of Orissa.When I left Bangalore on the morning of 5th December I was just a representative of Manipal Foundation who are supporting a few centers there. However at the end of 7th December, I was a new and hopefully a better person. It is a 7 hr drive from Bhubaneshwar to Gajapati. I was received by Rajesh from IIMPACT at Bhubaneshwar. He was with me throughout my visit and his friendly nature and hospitality truly reflected the IIMPACT culture, a taste of which I have had in Gurgaon earlier this year. We reached Taptapani, a OTDC hotel, where I was booked to stay, at 5 pm. We left my luggage in the room and immediately left to see the evening centers. The trip made me realize how remote the locations were ! We travelled from 5pm till 9 pm and were able to see only two centers. 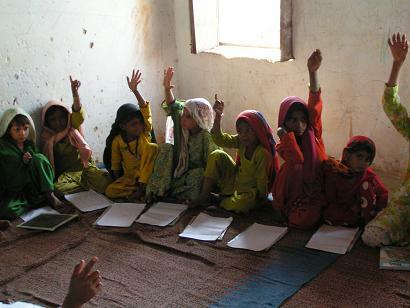 There was no electricity but the classes were in full swing. At Gaptima, the teacher, Ms. Pushpitha Mallick was truly impressive. She is the first generation college goer of the village. A tough looking young woman, who obviously took her job seriously. Because there was no electricity, but we were greeted by the girls, all standing and reciting the mathematical tables in a musical note. The sight really impressed me. The next day we started our journey at 8 am. We were joined by Mr. Duryodhan from CCWD through whom IIMPACT is getting the project implemented. For a person with such a villainous name, Mr. Duryodhan came across as a crusader who walks the entire forest and I noticed that every person on the way was known to him and he had something to ask them regarding their welfare. All the centers we saw were remote but very well run by the teachers. The handwriting of the girls was uniformly beautiful. Maybe because the Oriya script itself is very artistic. The girls did mathematical sums in the Oriya script and for my benefit did all of it again in the Arabic numerals. In a span of one year they have mastered two languages! Simili was the biggest challenge of all. We had to trek a long way on the rough terrain. I struggled but did not give up because I saw women and children walking the same way with big loads on their heads and children on their hips. I had to carry only myself. The villagers were very happy to see a “city person” who had taken the trouble of coming to see them all the way. They wanted us to stay back for the night, have dinner, etc. I took leave of them with the promise that I would come back soon to be their guest. We had more centers to see! Simili has almost 40 girls enrolled in the center and a good number waiting to enroll. I request IIMPACT to open one more center at Simili at the earliest. At Patipanka the girls greeted us with a welcome song composed by their teacher. The girls are very talented; most of them have such lovely voices. Our last visit was Pudkima where a young girl rendered a song in Oriya – a prayer to the Lord to help her through the “sansar sagar”. The song continues to haunt me – the lyrics so devotional and her voice so divine. As I walked out of the center I wonder what the future had in store for the girl – whether the Lord will help her sail through or not. But then He has sent IIMPACT to them and the girls have reasons to look forward to a better tomorrow. I along with Mrs Nirmala Tandon and Shri P Bhatt Co-coordinator paid a visit to the Chandoli Learning Centre on the forenoon of Wednesday, Dec 7, 2011. During some two hours that I spent at the Centre, I took the opportunity of interacting with the children, and members of the local community, both men and women, some of whom were the parents or elders of the children at the Centre. The children enrolled numbered 30, 10 of whom are at class 2 level, as many as 17 at class 3 level and 3 at class 4 level who are shortly going to move up to Class 5 ( the highest class up to which a Learning Centre provides education). The attendance on the day of my visit, was almost cent per cent. While approaching the children, I had in mind some of the observations on the state of literacy in India, as reported in the Annual Status of Education Report (ASER) 2010 which I had occasion to go through., a few days earlier. According to this report while many children in standard I and II were incapable of reading letters , majority of children in Class V could read only Class II level text. 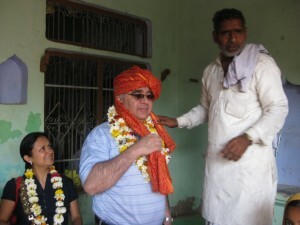 On January 7, 2011, we visited the Kankadkhedi and Raiveli centers of IIMPACT. Walking into the first center was like walking into a temple. There were throngs of people there to greet us – children, their parents, village elders – all with smiles and the same glint of hope in their eyes. They garlanded us to welcome us. I was moved to tears. We entered a very old room, painted in red, with cracked walls and a faint natural light diffusing in from outside, where the little girls sat in line, their backs against the walls, their heads covered in shawls to bear the fierce cold, their eyes peering into us with a heartwarming mix of curiosity and shyness. Upon instruction from two young and very able teachers, the girls then performed songs, recited poems, solved arithmetic problems on a small blackboard in the corner – all with an uplifting confidence, rarely faltering – offering a glimpse of a future, secular India, and reaffirming the notion that no country can truly progress until its women are educated and empowered. The second center was a few miles further south, in another small village with no paved roads and no proper sewage system. This center was painted a lush blue; recently so, I found out, thanks to one of the oldest women of the village, who now lives all by herself with no one to look after her. Again the same overwhelming welcome, the positive energy and the humanity, the air so full of hope and posing the question again and again in my mind – how is it that utter deprivation preserves the innocence of the human spirit? In addition to the children’s routine of poems, reading and math, blankets were distributed at this center, in the hopes that the girls would be able to fend off the looming cold from the surrounding mustard fields. If there is such a thing as a religious experience, this was it. Thanks once again for the opportunity and for doing such inspiring and courageous work. These are the instances and efforts that give true meaning to life. Last Saturday, accompanied by Nimmo, Krish and I visited the IIMPACT school in Rewasa in Mewat district that I have been sponsoring. I have, over the last year or so read all the updates and reports emailed to us by the IIMPACT office. Great job, guys. I have looked at lots of photos of happy little girls in classrooms in the IIMPACT schools. But nothing can compare to the energy, happiness and vibrancy levels that one experiences in a personal visit to a school. We were welcomed by the village sarpanch with warmth and affection. This, despite the fact that they were required at another spot, where some serious mishap had occurred. The ladies of the village had also gathered whose little girls were now experiencing a school for the first time in their lives. There were broad smiles on all faces, the men, the women and the children. It made one realize the importance of community acceptance before even a single girl child can be educated. And it was evident that the community had not only been won over but were fully participant in the education of their little girls. The high light of the visit of course was the time spent with the 30 little girls in the class. Their age ranged from 5 years to maybe 9 or 10 years. It was explained that the class was divided into 2 groups, the average learners, and the fast learners. The teacher, in this case Rupa, worked her way through both groups, at the same time. And what a great job she is doing! I was surrounded by 30 happy and smiling faces, bursting to break into poetry, song, maths tables and the English alphabet. No back bencher here, I discovered. Everyone wanted to be centre stage and showered me with their knowledge and affection. I sat in the center of a circle on the ground and the little ones kept inching closer and closer. I felt my hair being touched, by back gently tapped and everywhere I looked was a sea of beaming little faces. It was an emotional moment. Here were 30 little angels, from a remote backward village, who could read, write and count, add and subtract and had an equally enthusiastic teacher who was mouthing silently everything they said with such pride on her face. And I thought there will be 30 families in the future who will have a literate daughter, wife, daughter-in-law and mother and what a huge difference she will make in her family and her community and her country. Maybe I got a little carried away, but there was no doubt in my mind, the greatest gift you can give a child was education and I was so so fortunate to be able to help towards providing this to my 30 little ones in Rewasa. My compliments and gratitude to IIMPACT for giving me the opportunity to be able to do so. Enjoyed the visit and glad it finally happened and I could see all the good work being done in person and to see so many bright sparks amongst the girl students, enthusiastic & confident to stand up and speak in front of new people. The involvement of the village elders & the mothers egging their wards on was an eye opener and speaks volumes of the success you have in this being a program with huge community involvement and support & key foundation for success. Thanks for taking the time to join us and congratulations for all what’s been done.